Throughout the world, Mobile phones and the internet are increasingly a part of people's lives. The promise of these technologies aiding development is beginning to be realised. In this report Gamos, together with its project partners, presents a comprehensive picture of the global mobile telephony landscape as it currently relates to advancing development. Analysis of the key examples of where mobile have proven effective, challenges to the use and development of mobiles and regional trends all point towards significant future opportunities. This study was undertaken using a variety of techniques, including desk based research; in-depth, semi-structured interviews with UNICEF operations staff and representatives of Mobile operators and Thought Leaders in 14 countries and; 10 case studies of existing M4D projects. In depth analysis of global mobile and internet usage reveals a changing world. In 2000 there were approximately 720,000 mobile subscriptions worldwide. Today, there are more than 5 billion. More people than ever before have access to mobile phones and many of them are those at the bottom of the economic pyramid living in less developed countries. The mobile industry believes this number will exceed 6.2 billion by 2013. Between 2000 and 2008, the rate of growth in mobile penetration was fastest in Sub-Saharan Africa, where it rose from just over 1% to over 31%. However, the region's penetration rate remains the lowest in the world. This rapid growth can be attributed to widespread liberalisation of the communication markets. The subsequent increase in competition has driven down prices and pushed providers to expand their operations in search of new markets. This has resulted in the rapid extension of mobile networks, falling prices of services and mobile handsets, and innovative business models that have reduced operators' capital and operating expenditure. This has been complimented by huge investments in mobile network infrastructure, the increased flexibility of prepaid mobile services and the falling price of handsets. By 2015 only 4.4% of the world's population will live in the "coverage gap", outside of mobile network coverage. The implication being that M4D technology and initiatives have the potential to impact many of the world's poor. After firmly establishing the expediency of using mobile technology to achieve development goals through economic and social indicators this report goes onto asses the M4D landscape. Analysis of the M4D landscape reveals a variety of stakeholders. There are increasing numbers of mobile-based projects, and donors such as the World Bank, infoDev and the Bill and Melinda Gates Foundation continue to invest in M4D. There is evidence that governments are interested in using mobiles as service providers, yet active projects in developing countries remain few. Most cases are found in Asia, where concepts have been proven, and more mature mobile markets are seeking new revenue streams. The Philippines Department of Agriculture, for example, developed a service that gives farmers advice about fertiliser use via the mobile phone. Impetus has also come from mobile operators who have or intend to develop services with a development impact that also represent a return on investment – M4D that is revenue generating and saleable. Operators are willing to contribute to development goals, but only by "doing business as usual". Common themes in business strategies of regional operators include network extension into rural areas, network upgrading (focused on urban areas), innovative applications, content, and services and, a focus on youth. However, up to this point, mobile operators have tended to support M4D through concessions such as free or subsidized SMS tariffs, which have been negotiated as part of Corporate Social Responsibility programmes. These are typically seen to be poorly resourced and integrated and not utilising the latest technology. Interviews with UNICEF staff in 11 country offices highlighted 41 examples of the use of mobiles in their programmes. The projects reflect a growing awareness of RapidSMS, mostly used for health-related applications involving the exchange of data via SMS. Other innovative ideas included the integration of mobiles with social media, and the use of mobile payments platforms as part of social protection programmes. 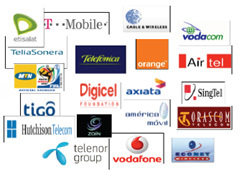 This study includes further information highly pertinent to the M4D landscape including analysis of the most popular mobile services in the case study countries and a comprehensive list of organisations working in the M4D space. M-PESA, launched by Safaricom in 2007, has given 6.5 million Kenyans, most of whom were unbanked, access to financial services for the first time. The Sri Lankan provider Dialog has worked with the Disaster and Emergency Warning Network to develop an early warning system. Mobiles are used to disseminate emergency information and advice to reduce exposure to hazards. The Jokko Initiative, a UNICEF programme in Senegal developed in collaboration with Tostan, an NGO focused on community empowerment. Jokko has been successful in teaching women, teachers, community health workers, and other Senegalese villagers basic literacy and SMS skills. This report paints a picture of M4D being at a crucial stage with greater investment and exposure needed to realise its huge potential. Of the 14 countries studied in depth Uganda had the most M4D initiatives with 30% of the total. The relatively high number of initiatives in Uganda may indicate that it developed a critical mass of M4D initiatives, with a number of development organisations and NGOs in the country focused on using mobiles. Despite many challenges, such as poor enabling environments, low levels of rural access and a lack of local content there is reason for optimism. Assessment of these challenges leads the writers to conclude that most can be overcome in the short- to medium-term if the general trend towards liberalisation and competition, use of targeted policy and regulation, the ambitious rollout of mobile network infrastructure in rural areas and growth of mobile penetration continues. Investment in M4D is crucial. Access to mobiles will increase among the poorest, providing a low cost platform through which to deliver programming to isolated and vulnerable groups. Localised ICT capacity needs to be strengthened. While the Innovation Unit is training and using local programmers, there still remains a lack of local capacity to lead on implementation of projects. Projects have continued to rely on US-based programmers with implications for cost and time. The M4D community needs to attract greater commercial interests, and to introduce technological standardisation to enable systems to work together and in multiple locations. As part of creating a positive enabling environment for M4D, there is a need for evidence on the impact of M4D based on critical assessments and evaluations and a greater dissemination amongst governments, providers and practitioners. The m-finance space offers huge potential and could be incorporated into exiting programmes. In addition to opportunities to streamline procurement and payment activities, m-finance can play a role in social protection and emergency response programmes. The expansion of multi-stakeholder partnerships between users, providors, government, donors, academia and NGOs will be crucial to the expansion of M4D. International organisations with powerful leverage such as the GSMA Development Fund and the International Telecommunications Union, UNICEF and smaller research and project partners such as Gamos have the potential to greatly influence the M4D landscape.